Goldfield, Nevada, was arguably the last real US gold rush of this century - at least in terms of overall production, which was significant. 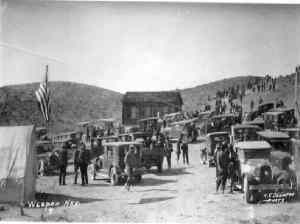 However, the argument can be made that when limited production is considered in the context of gold fever (acting like a magnet to attract one thousand and more people to a remote area of the Nevada desert) then the Weepah Hill rush of 1927 represents the last real gold rush in the US to date. This little-known area is located in Esmeralda County, Nevada, and Weepah was about eighteen miles Southwest of Tonopah. Weepah is particularly significant for researchers, as it was the first real auto camp - where people lived and slept in their vehicles. A tin tub served for bathing, and a campfire sufficed for a kitchen. In other words, Weepah was crude living in the extreme. 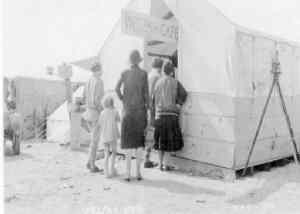 Real luxury in the Weepah of April 1927 would be to dine at the Weepah café, a crude tent / clapboard affair typical of Nevada boom camps. Weepah seems to have been promoted by Los Angeles interests. There were newsreels produced by the International Newsreel Company of Los Angeles, although it is unknown if the relevant footage is still in existence today. In addition, postcard promoters and photographers intended to publicize the find - accounting for the picture postcards you see here. Meanwhile the great boom camp promoter George Graham Rice - promoter of Greenwater, Goldfield and Rawhide - was busy with legal matters in the East at this time (namely his prosecution for fraud). It is reported that Rice had interests in promoting Weepah, but by the time Rices resident agent arrived, the only real significant finds had already been worked out. And this was the crux of the matter. A large, shallow deposit had been discovered by two young prospectors working the area - ostensibly searching for the so-called lost Breyfogle mine. The problem was that this single find was the only real deposit of any real value in the area. The geology of the Weepah district suggests that there may be other pockets of rich ore at varying depths, but the patchy nature of the deposits and the technology of the time did not allow the district to develop any further. So Weepah lies fallow to this day. 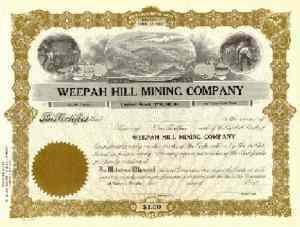 Typical of the era, mining stock promotion was rampant, and an example of a Weepah stock certificate is included above. 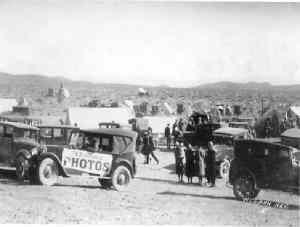 The real lesson for researchers is that an estimated one thousand five hundred people camped out in their cars in a remote area of the Nevada desert between April, 1927 and November, 1927 - looking for their personal El Dorado. An El Dorado that never became a reality.